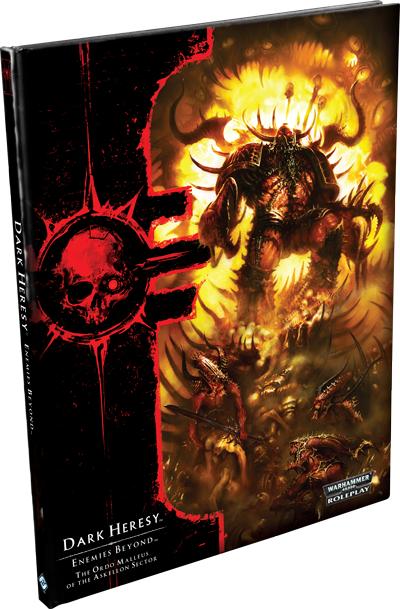 12 October 2015 | Dark Heresy 2nd Ed. 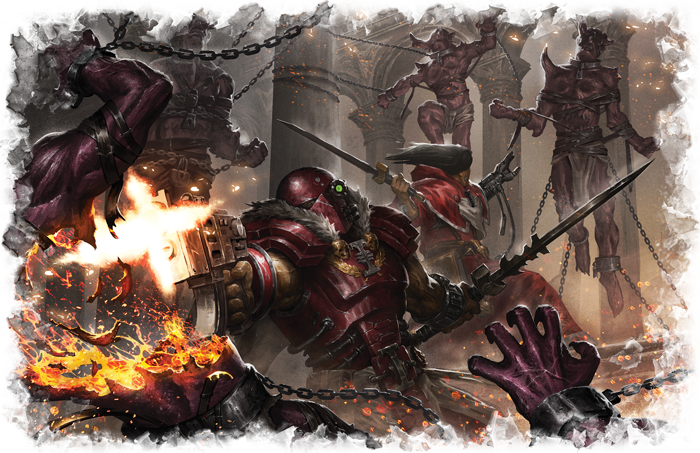 Fantasy Flight Games is proud to announce Enemies Beyond, a new supplement for Dark Heresy Second Edition! 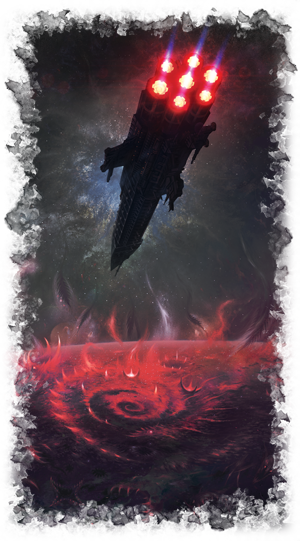 The Imperium fights in a time of constant war: there are countless threats to humanity’s continued survival, and more arise every day. 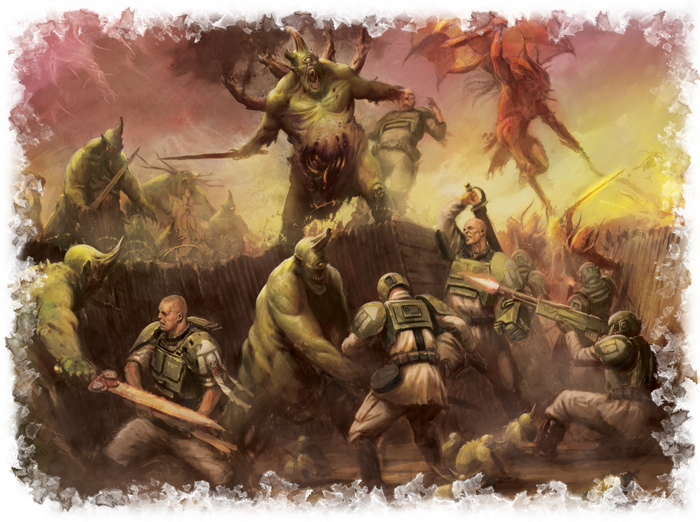 Heretics and mutants infest the most populous hive planets, spreading their evil in dark places far from the Emperor’s light. Xenos races attack from every edge of the galaxy, expanding their foul empires and mocking the order and justice that flows from the Emperor’s throne. Yet all of these foes can be acknowledged. Every loyal citizen of the Imperium is wary for heresy, and the xenos races are a well-known threat. So perhaps the greatest war is the war that must be fought in secret, against the Daemons and the powers of Chaos that live within the Warp. Mankind uses the Warp daily for both travel and communication; if the true nature of the Warp and the beings that dwell within were to become known, civilization would surely descend into anarchy. In Enemies Beyond, you can become an Acolyte serving with the Ordo Malleus—those tasked with protecting the Imperium from the daemons of the Warp. Here, you’ll find new Acolyte options allowing you to play as an Exorcised character or a powerful Astropath. Gazetteers offer information on the Daemonic threats to the Askellon sectors, introducing new types of worlds such as Penal Colonies and Daemon Worlds. The GM will even find rules for creating his own Daemon Princes, details on the rites of possession and exorcism, and guidance for crafting the Acolyte’s adventures with the Ordo Malleus! The Askellon sector is old, almost beyond reckoning, yet the influence of the Warp in this sector stretches still further into the past. In Enemies Beyond, you’ll find an account of Askellian history with a special focus on the terrible Warp Storm, known as the Pandaemonium, that rages constantly in this sector. Here, you’ll also find an account of the unending, secretive war between the Inquisitors of the Ordo Malleus and the Daemons that attempt to subvert reality and enter the Askellon sector. In the battle against the Ruinous Powers, yours is a thankless task. No medal will ever be pinned to your chest. No honors will ever be granted to you. Your efforts must remain deathly secret, lest Chaos utterly overtake the Imperium. What’s more, your war is endless. The Daemons of the Warp exist outside of time and rational existence, and even the most optimistic Acolyte would never hope of an end to your eternal struggle. Yet with these terrible obstacles comes the greater responsibility and the greater glory. You do not fight only for the survival of Mankind and the safety of the Imperium. You battle for the continuation of reality itself. More than mere history awaits your eyes in Enemies Beyond. You’ll discover potent new options for increasing the prowess of your Acolytes, including new home worlds like Penal Colonies and Quarantined Worlds, new talents to wreak havoc on the forces of Chaos, and dangerous new psychic powers that can turn the power of the Warp against itself. To attain even the smallest victory against this ultimate danger, you and your fellow Acolytes must fight fire with fire, using tools and practices that would be utterly condemned in other ordos of the Inquisition. You may take up deadly, proscribed weaponry, learn the secrets of creating Daemonhosts, broker Dark Pacts, conduct exorcisms, and even discover some of the terrible Daemonic Remnants that are the source of countless dark myths throughout the Askellon sector. Enemies Beyond also offers extensive details on each of the four Chaos Gods. You may face the servants of Khorne, the Blood God, driven by unrelenting lust for battle and death. The Daemons of Nurgle spread disease, corruption, and putrefaction, tainting all that they touch. Tzeentch may offer you forbidden powers and magics—abilities that could make you powerful enough to crush Daemons with your bare hands, but exacting a terrible price in exchange. You can even face the dark minions of Slaanesh, who promises pain and pleasure in equal measure for those who follow him. All of these Ruinous Powers are detailed in Enemies Beyond, along with the Daemons who follow them. GMs will also find tools here for creating their own Daemon Princes, granting them the chance to put a personal touch on any encounter with the Warp. The Ordo Malleus fights a secret war, daily performing heroic deeds that must never be spoken of. Sanctify your weapons and face the dread truth of the Warp. If reality itself is to survive another day, you must not falter in your duties. Fight the war for souls against the terrors of the Immaterium in Enemies Beyond! Look for Enemies Beyond at your local retailer in the first quarter of 2016!